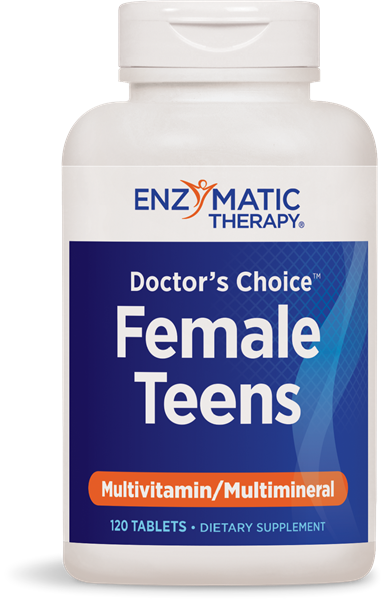 Doctor’s Choice™ Female Teens / 120 tabs - Nature's Way®. Teens are notoriously lax when it comes to healthy food, but many Americans have nutritional gaps in their diets - even when they try to eat a healthy diet. Multivitamins can help fill those gaps. Why choose Doctor's Choice™ Female Teens? Because it provides a strong nutritional foundation that also helps fill the gaps most often seen in teen diets. Additionally, vitamin A and C support skin health. * While iron is included as well - iron deficiency can be a problem for teenage girls - they lose iron every month during their menstrual cycles, and may not replenish enough through dietary sources alone. Take 4 tablets daily. Can be taken as 1 or 2 tablets with each meal. Do not use this product if pregnant or nursing; or if you have high blood pressure or cardiovascular disease. If you are taking any medications, consult a healthcare professional before use.